What’s the difference between 1300, 1800 and 13 Phonewords? When should I consider using a numeric number instead of a Phoneword? What happens if I get too much business from the Phoneword and I cannot cope with the extra work? Do I need to change telephone carriers? Do I need a new telephone line for the Phoneword? Can I use a Phoneword in more than one area? What areas are Phonewords available in? Will I have exclusive rights to the Phoneword I use? The major difference is how call costs are divided. The total cost of calls to 1800 numbers are the responsibility of the business who leases the number. Costs of calls to 13 and 1300 numbers are shared by the caller who pays $0.25 and the business who pays the remainder. We usually recommend Phonewords over numeric numbers because for most applications a numeric number is like a commercial that people think is funny but can’t remember what the commercial is for. It may be nice at the time, but it doesn’t increase the response rate in the same way that a Phoneword does because while a nice numeric number is easy to dial, it’s not easy to remember. And no one ever calls a number because it is easy to dial. There are however, a couple of situations where numeric numbers have advantages over Phonewords. We recommend using a numeric number when you have a foreign language audience or elderly audiences. If your business targets these audiences 1300 Easy Dial can help you find a numeric number that’s easy to remember such as 1300 400 500. For more information on how to purchase a numeric number, call us on 1300 EASY DIAL. This is the kind of problem most businesses wish they had! If you find that you are receiving too much business with your Phoneword, call us and we will provide you with some ideas on how you can turn this problem into an opportunity. No. You still keep your exisitng phone number with your carrier. 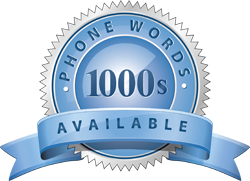 We will simply overlap your new Phoneword over your existing line and will bill you only for the calls made to your new 1300/1800/13 Phoneword. You will still receive your normal phone bill for line rental and outbound calls from your current telephone carrier. No. Your Phoneword will ring directly to your existing mobile, home or office line, and you still keep your existing phone number as well. Most Phonewords can be leased at postcode level, which means that you can target specific regions with your Phoneword. For example, if you are a hairdresser, you can choose to have your Phoneword in your suburb only or you could add surrounding areas. In fact, the larger your catchment area the more business your Phoneword will generate. Phonewords are available in every city and town in Australia. 1300 Easy Dial has a wide range of Phonewords. View our current list of available words or call us on 1300 EASY DIAL (1300 327 934) to speak with a consultant about your specific requirements. Will I have exclusive rights to the Phoneword I use ? You will have exclusive rights to the use of your chosen Phoneword in your selected region.